Whether you're already a fan of Ed Hardy designs or are simply looking for a new fragrance, browse our selection of Ed Hardy perfumes. These Ed Hardy fragrances are available in different scents for both men and women. In addition to their fresh scents, the fragrance bottles feature the artwork of Ed Hardy. Find the Ed Hardy perfumes that you can keep for yourself or give as a special gift. When choosing an Ed Hardy perfume, your options include eau de parfum and eau de toilette sprays. Just a little eau de parfum spray can go a long way, since it contains highly concentrated fragrance. Eau de toilette is ideal for spraying on a subtle scent or for layering with a fragranced body lotion. 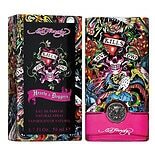 For men and for women, we carry signature Ed Hardy perfumes such as Hearts & Daggers and Love & Luck. If you need ideas for gift-giving, browse our assortment of Ed Hardy gift sets here at Walgreens.com. These fragrance gift sets can come with shower gel, sprays and even deodorant. Some also include different spray bottle sizes so that you can carry the fragrance with you wherever you go. Using multiple forms of an Ed Hardy perfume can help you layer the scent to make it last throughout the day or evening.